84-year-old Vijayamala comes from an extremely remote village named Bhatpara Tea State Kalchini in Alipurduar District of West Bengal. Vijayamala stays with her daughter and a grandson who works as a labourer in the tea garden. Vijayamala developed a sight problem a few years back. Her eyesight had worsened over time. Poverty-stricken, seeing a doctor or getting a surgery were out of question. A screening camp organised by Sightsavers had brought a ray of hope to Vijayamala’s life. She was accompanied by her grandson to the camp. It was found that Vijayamala suffered from cataract. She was immediately referred for surgery. 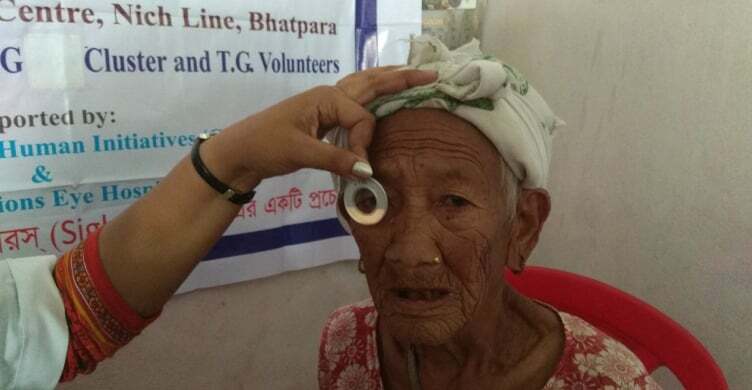 The cost of surgery was taken care by Sightsavers. After the cataract operation, Vijayamala now waits for the patches to be removed and see the world again.